Shooting photos and videos is about more than capturing memories. A great camera brings your creative vision to life with striking clarity. The Nikon D5200 is exactly that type of camera—an exceptional HD-SLR designed to draw exciting new perspectives out of everyone who shoots it. Optimized for creativity, streamlined for flexibility, it'll awaken your passion and inspire some of the most spectacular photos and videos you've ever captured. Creativity and flexibility were considered in every aspect of the D5200. It has a 921,000-dot Vari-angle display that lets you shoot from just about any position—hold the camera overhead for a view above a crowd, at ground level for an interesting close-up of a flower, or just enjoy easier video recording and self portraits. For shots that have both very dark and very bright areas, D5200 includes built-in HDR (high-dynamic range). It takes two shots at different exposures and blends them into one amazing image. And an exciting collection of built-in effects and filters opens new possibilities for expression: isolate a single colour, explore black & white, posterize, miniaturize—the creative techniques pros spend years mastering are now conveniently at your command. Perhaps your greatest inspiration will be the spectacular quality of every photo and video you shoot with the D5200. Its highly sensitive 24.1-megapixel DX-format CMOS image sensor captures your vision with lifelike brilliance—marvel at the vibrant colours and razor-sharp detail, even in low light. Legendary NIKKOR lenses, marvels of clarity and quality, are the perfect companion for the D5200, drawing peak performance out of the sensor. Our intelligent Scene Recognition System compares your shot against an onboard database for optimum exposure, and EXPEED 3, the processing power in our acclaimed D4, makes it all happen in an instant. The thrill of creating a great photo is topped only by the excitement of sharing it. With the D5200, you'll have many great photos to share, so we made it easy. Just add the optional WU-1a Wireless Mobile Adapter and instantly transfer your shots to a smartphone or tablet± via Wi-Fi. Then share your favourites online as usual: email them, upload them to your favourite social networks or photo-sharing site like Nikon Image Space. You can even use your smartphone or tablet as an external “live view” monitor to see what the camera sees and fire the shutter—perfect for getting into photos instead of always shooting them. Note: These functions require an Android or iOS device and Nikon's free Wireless Mobile Adapter Utility app, available on Google Play and the iTunes App Store. 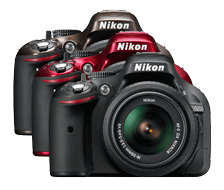 The D5200 includes Nikon's latest innovations for creating beautiful videos with virtually no choppiness. D-Movie mode now features Full HD 1080p 60i for visibly smoother sequences, a first for Nikon HD-SLRs. Full-time-servo AF (AF-F) and subject-tracking AF work together to keep moving subjects sharp and in focus, and face-priority AF instantly detects and tracks up to 35 faces in a scene. 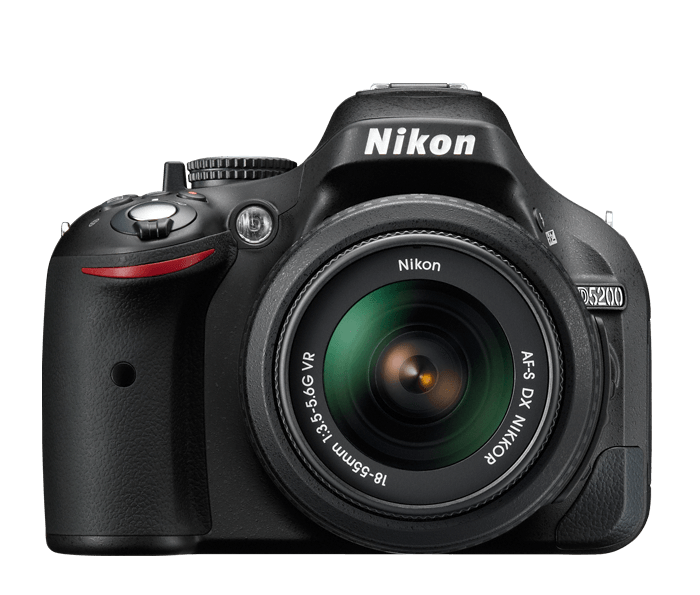 D5200 also has a built-in stereo microphone that can be controlled automatically or manually via 20 incremental steps, another first for Nikon HD-SLRs. Whether you shoot short clips or cinema-style movies, the D5200 makes it easy to take your projects to the next level. No matter where your subject is within the frame, the D5200’s 39-point wide-area autofocus system keeps it in focus so you can fire up to 5 fps. 3D Subject Tracking, powered by a 2,016-pixel RGB sensor, locks onto your subject and tracks it with exceptional accuracy. Improvements to the D5200's optical viewfinder make it easier to identify and capture fast-moving subjects, even when panning the camera. When asked why they choose Nikon gear, pros and serious shooters consistently mention NIKKOR lenses among their reasons. The D5200 comes equipped with the AF-S DX NIKKOR 18-55mm f/3.5-5.6G VR lens—an excellent lightweight, multipurpose lens for nearly all shooting situations and an ideal match for the camera's DX-format sensor. You'll be at home with the D5200 in no time. Using visual representations of each setting to show you exactly what's changing with each adjustment, a redesigned display groups your most frequently adjusted camera settings for faster access. Whether you're shooting a group portrait (that includes you) or an intricate macro shot, a remote control is one of the most convenient accessories you can have. The new WR-R10 and WR-T10 Wireless Remote Controllers communicate using radio frequencies instead of Infrared, so you'll have control even when there's no direct line of sight between devices.